Risk management is an extremely important part of cryonics and is deeply ingrained in the culture at Oregon Cryonics. 1. Perceive Hazard. Identify the hazards in a list. 2. Process Risk. Assess both likelihood and severity by assigning numbers to each hazard. The yellow cells were prefilled by us only for illustrative purposes. One major parameter that can be adjusted is the odds of low quality preservation. Change this parameter to see the results. The odds may currently be well above 90% (poor) since none of the current protocols in use by any cryonics organzation show validated reasonable structural preservation. This seems to be the parameter that we have the most control over, and that we may be able to eventually get below 50% on average, although there would still be huge variation between cases due to circumstances surrounding death. But the main utility of this tool is being able to change the risks of disaster and watching how even small risks add up over time. Push the reanimation estimate out to about 500 years to get it out of the equation, then adjust the disaster numbers. Watch how the chance of survival drops off year after year. Sitting in storage is not inherently safe. 1. Disaster risk numbers are largely unknown, although we might be able to research them with enough effort. 2. Future risks are so unknowable as to be meaningless. 3. The risks will change very significantly over time, based on institutional processes, people, and advancing technology. 4. Individuals can change the outcome. For example, if a cryonics organization looks like it's headed for insolvency, families and friends of the patients have strong incentives to keep it running. All windows have been eliminated from the clinical facility (not the administrative areas) either with interior plywood or with full framing, drywall, and siding. Standard ADT alarm system is in place in all of the facility. Camera system with DVR and remote access is installed. Extra doors have been eliminated as much as possible. High security Medeco deadbolts are in place on all exterior doors, and latches are configured to remain locked at all times. The patient care vault was recently moved to a newer facility with sprinklers. fema.gov lists fire statistics which are interesting. Different levels of fire resistance can be engineered into any building. The ultimate goal is an entirely-concrete vault, which is the only known fireproof structure. This must be weighed against the cost as well as the tradeoff of mitigating other risks which may be more important. The future facility will be adjacent to an airport. Because of how it will be situated against the side of a hill, a direct aircraft hit is unlikely. A glancing blow followed by fire is possible but extremely unlikely. A car or truck could drive off the road and hit the building, but it would be moving slowly due to the hill. Fences and concrete barriers would help, but are not immediately planned. Fault lines are 50 miles off the coast and might cause a tsunami which would not affect us. Earthquake risk is low in Salem. G forces in the very worst earthquakes in the world are less than 1G, similar to turbulance on a jet, unless ground liquefaction is involved. Buildings are at risk if not engineered to withstand earthquakes, so our future building will be steel instead of concrete, which will make it essentially earthquake proof. The equipment within buildings, including dewars, will not sustain damage if anchored properly. Damage to dewar contents is prevented by packing tightly with padding. One final risk with earthquakes is temporary loss of access to liquid nitrogen due to highway inaccessibility. Loss of highway access in all directions for more than a few days is nearly impossible. Our costs are low for storage, and are instead mostly for cryopreservation services and local standby. Staff and rent costs can easily be permanently lowered, if necessary. Also, see Patient Care Fund. This includes someone accidentally leaving a lid off or forgetting to check levels. A computer program currently monitors levels with thermocouples and scales and sends out text messages to staff as needed. Separate active parallel monitoring is planned, probably based on a heartbeat (hardware, not biological) signal sent to a remote server. This is not a short-term risk. Our status as a licensed medical facility grants us certain rights that could not be revoked on short notice. Professionalism is one long-term strategy to prevent a rollback of our status. Possible in the present facility, but essentially impossible in the future facility. The people who run and manage Oregon Cryonics, especially Dr. Sparks, may die or otherwise become incapacitated. This is currently a low risk, but the Bylaws of Oregon Cryonics designate alternate directors if necessary. Over a longer time period this is a significant risk. Power failure happens a few times per year, and typically lasts a few hours. This is inconvenient, but does not present a significant risk to patients. Staff generally remain on site during a power failure for security. An installed backup generator currently kicks in during a power failure to help mitigate the risks. There is a chance that war will affect us at some point. Oregon might be directly attacked or fuel shortages might occur. Liquid nitrogen might be viewed as non-critical, and might simply be unavailable at any cost. To mitigate this risk, our standard protocol is chemical fixation prior to cryopreservation so that temporary warmer temperatures could be somewhat tolerated. This would also be a situation where we might make use of the reanimation fund to provide preferred care to some patients. Liquid nitrogen is currently low cost because it's a byproduct of large air liquefaction facilities. With higher technology, it might be possible to produce the other gasses without needing to also liquefy so much nitrogen. The price of liquid nitrogen could then go up significantly. We simply assume that this will eventually happen, and this assumption is the basis for our higher fees. 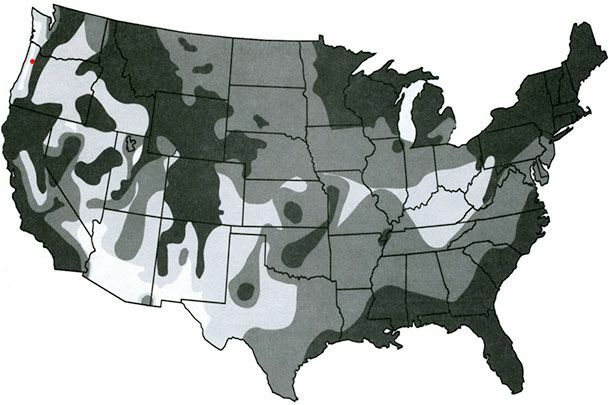 This map shows a composite of four types of natural disaster: earthquake, hurricane, tornado, and blizzard. Salem is the red dot at the left, in one of the lowest risk areas possible. The New York Times shows a Natural Disaster map by Sperling's Best Places, listing the Salem area as the lowest risk metro area in the US. It seems to overemphasize tornadoes and underemphasize the California earthquake risks. Lots of composite maps have been produced for natural disasters, and they all show a bit differently.